Isn't Shadow and Sand a romantic name? I named the a4A child's blanket I finished the other day after The House of Sand and Fog, the disappointing novel I listened to as I began this project. I wasn't disappointed in the blanket, though. Thanks to Ann and Kay of Mason Dixon Knitting for providing this easy and stress free knitting technique - log cabining. Here is the mid-January beginning of this blanket. I used leftovers of worsted weight wool yarn on #7 U.S. needles. It's all garter stitch, and each stripe is built with picked-up stitches on the edge of a previous stripe. It grows out from the middle - no seaming. It's hard to estimate the amount of yarn this blanket took. Maybe 1,000 yards? The measurements are 42 x 39 inches. It should be perfectly square, but I guess variation in the gauges account for the difference. How polite she is. She knows she isn't supposed to touch the blanket - when I am looking, that is. So she sits quietly awaiting her chance. I can't figure out how to remove the formatting on the paragraph above. If you click it you will get a close up of Boo. Did she cause that? Regarding Anne's recent sock post - thanks to her for the follow up. When I asked if David's socks fit, she said he hadn't worn them yet. I am glad to learn that they fit. They seemed so enormous off the foot. Remember, I have only experienced knitting for a man with a size 81/2 shoe. David wears a 12. I am not too concerned about the baby's sock not fitting though. I only made it to try a Cat Bhordi pattern and to not neglect a gift for baby as I was making a pair for each of her parents. I'm glad Raggedy can use them. Actually, David's feet are a 12 and a half. Sometimes even a 13. Love the blanket! And I saw the movie "House of Sand and Fog" - not my cup of tea - but I loved "The House of Sand" aka "Casa de Areia". 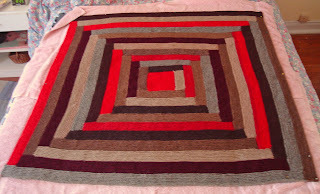 Gorgeous blanket; the colors especially work so well together. And a wonderfully glamorous name too! The blanket is lovely. I am envious of how well the colors worked together. 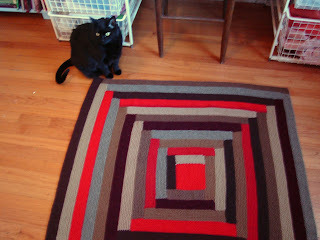 My current log cabin blanket in progress also mixes reds and browns with far less attractive results. I actually liked "The House of...", both novel and movie and especially the movie.